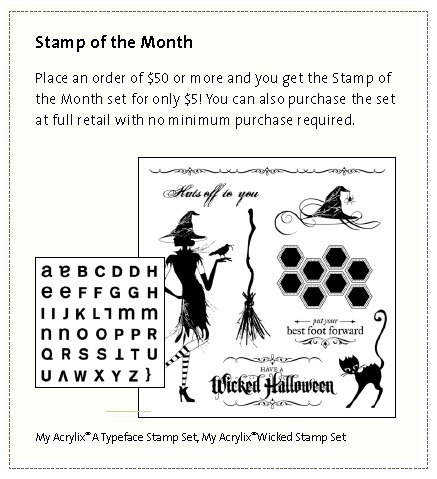 WELCOME to our August Stamp of the Month blog hop featuring this month's new SOTM - "Wicked" S1108! If you've just joined me from Shannon's blog, then you are on the right path! 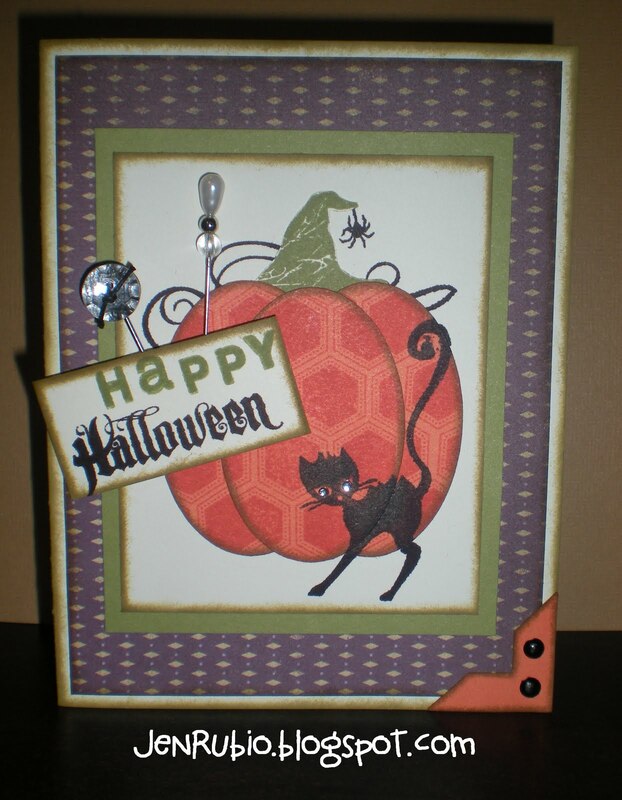 First, I'm sharing a standard size card (above) that I created using a little bit of Smokey Plum B&T duos paper from our NEW Sonoma X7143B paper pack. Notice how I've used the "witches hat" image as the stem for my pumpkin! To make the stem I first stamped the image with Black ink on my 3"x3.75" piece of colonial white cardstock. 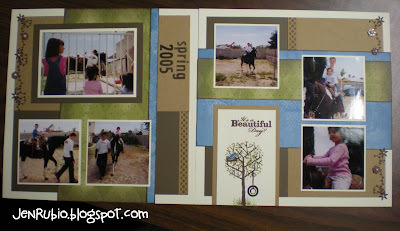 Then I used the "paper piecing" technique to add the green stem by stamping the image again with Olive ink on a scrap of Colonial White cardstock, cutting out just part of the "hat" image, and then adhering that part over top of the first image I stamped with Black ink. To create the pumpkin, I cut out three 1.5" ovals from Sunset cardstock using the "Oval3" button with our NEW "Art Philosophy" Cricut Cartridge!! Then I stamped the honey-comb-like image with Sunset ink ("tone-on-tone" stamping) on each oval and sponged the outside edges with Desert Sand ink. Then I layered and adhered them together over the stem to create the pumpkin! 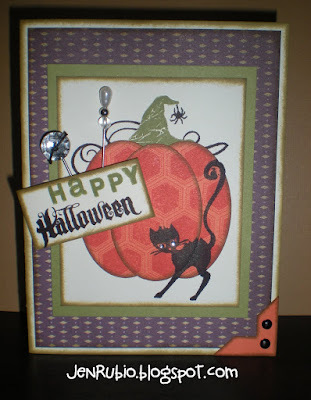 I also used "masking" technique to stamp just the word "Halloween" on the 1"x2" piece of Colonial White cardstock. I added the word "Happy" using stamps from the "A Typeface" stamp set that is your FREE gift "this month only" when you purchase the "Wicked" Stamp of the Month for just $5 with any $50 order! (both stamp set images are shown at the bottom of this post and remember, you can click on any of my photos to see them larger). 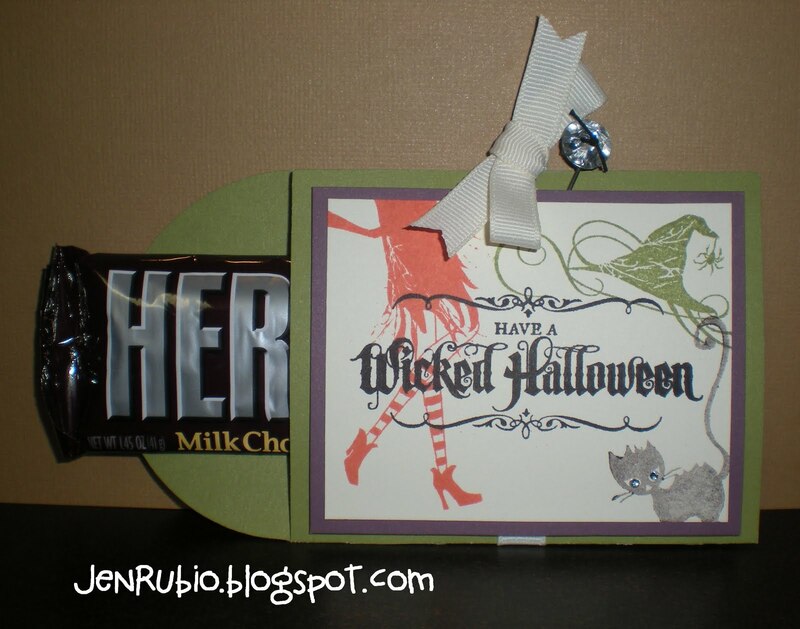 Next, I'm sharing a "candy bar pocket" (above) that I created using the the "Tag5" plus "Card" buttons with our NEW "Art Philosophy" Cricut Cartridge (I just LOVE our new Cricut Cartridge and have been playing with it a lot this week)!! 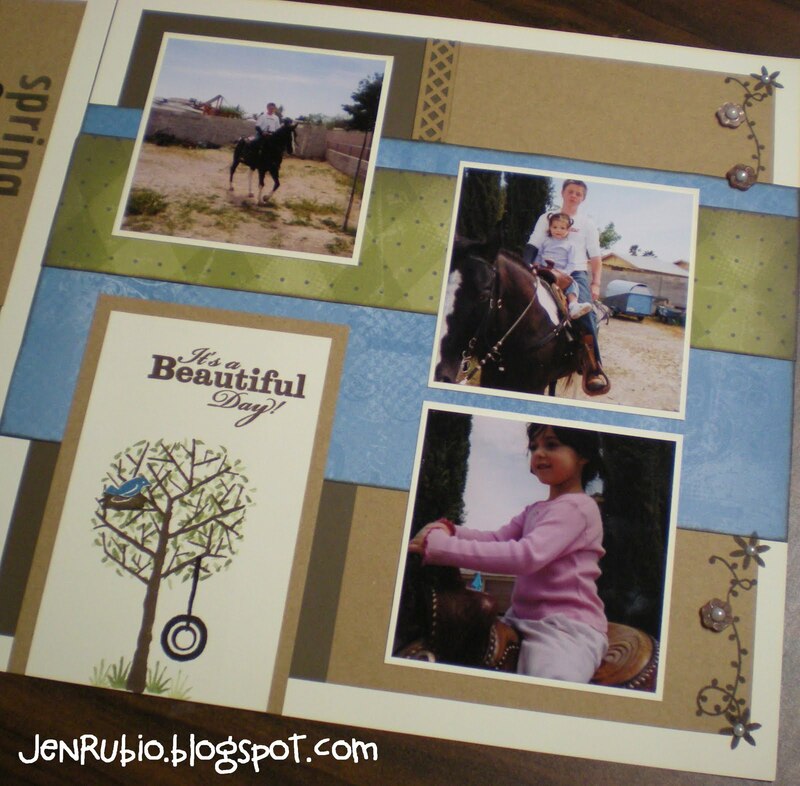 The card/pocket is cut from Olive cardstock at the 5.75" inch setting (this allows you to cut two from one sheet of 12x12" cardstock). Colors used here again are Black, Colonial White, Olive, Smokey Plum, and Sunset (the cat is stamped with "2nd generation" Black ink). The "Bling Assortment" Pin Z1466 and Pin Clips Z1612 that I've used on both projects are held in place by being stuck through the 3-d mounting tape I used underneath my card elements to give them some lift and dimension. 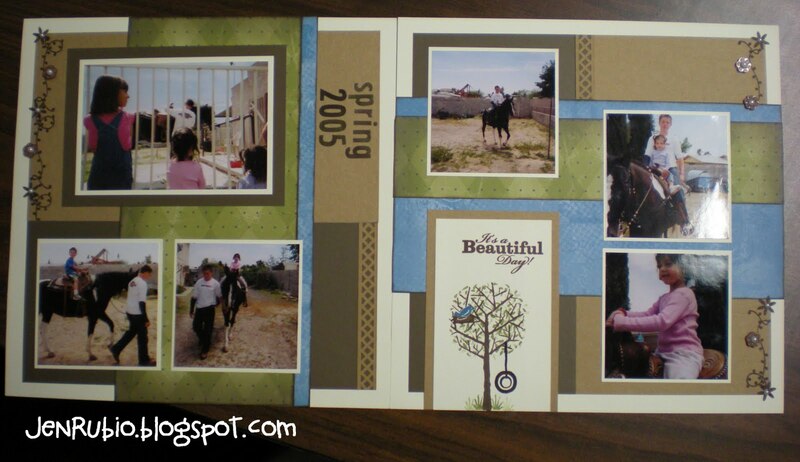 Finally, here is the card I created with my customers recently at my New Idea Book Reveal Party and Open House (above)! 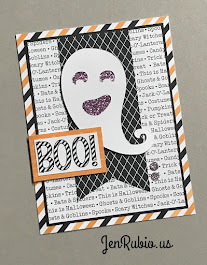 Don't you just LOVE that this stamp set can be used to create a lot more than just items for "Halloween"?!! 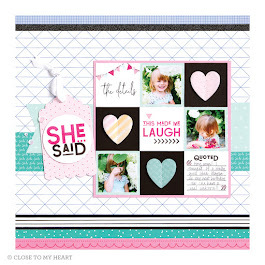 I am looking forward to using the "honey-comb-like" image and the "flourishy border" stamp as well as some of the other sentiments on a variety of different projects. This card is also made with a few other brand-new products including the Love Life D1482 stamp set, Roxie paper pack X7140B, Just Blooms paper shapes butterflies Z1463, and Bling Assortment buttons Z1466! I hope you've enjoyed seeing my artwork! Now you can continue on with the rest of this blog hop and see more creative ways to use this "Wicked" stamp set by visiting Haley's blog next! Enjoy!! Here are some great ideas for using the Cricut® to add more "flair" to your already beautiful artwork!! 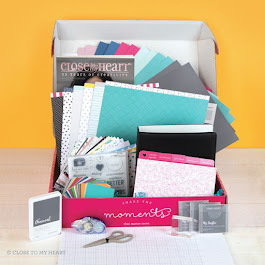 This video also features the "Dreamin" Workshop-on-the-Go kit that is shown on page 37 of the NEW Autumn/Winter Idea Book. The first NEW Workshop-on-the-Go (WOTG) I've chosen for us to use and create with together at my upcoming workshops and crops in August will be the SONOMA kit shown on page 43 of the NEW Autumn/Winter Idea Book! (and I will share more details about this upcoming workshop opportunity here on my blog very soon)!! 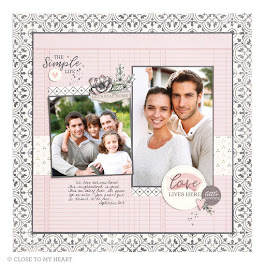 Create handcrafted artwork in a snap with our NEW Cricut® "Art Philosophy" cartridge! Simply plug the cartridge into your Cricut® Personal Electronic Cutter machine (sold at retail stores) and you’re ready to cut any of the 700 shapes, ranging from elegant rosettes and lace to trendy gift boxes and banners! You’ll also receive three My Acrylix® D-size stamp sets as well as three sets of 9" × 12" Dimensional Elements that work in tandem with the cartridge. 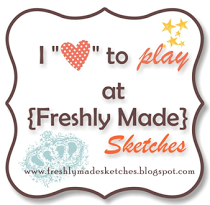 On top of that, numerous My Acrylix stamp sets in the Idea Book pair wonderfully with images on the Cricut® cartridge! Contact me today to get the entire collection for just $99! 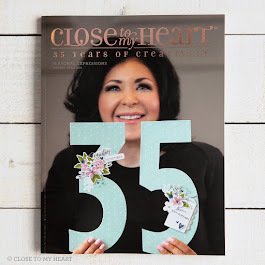 Here's a YouTube video that will give you an idea of just HOW MUCH FUN I had at the Close to my Heart Convention recently (turn your volume up because the music will make you smile and feel good too)! It truly was a week full of memories that I will always treasure! I was so blessed to have 11 of my consultant team members attend with me! Our friendships were strengthened and we had such a blast together!! (imagine it being like one big slumber party with 2,000 of your closest creative friends for 3 days in a row, lol). Next year's Convention will be in Dallas, Texas from July 12-14, 2012...and you are invited to join us next year (all you need to do is be a CTMH consultant)! Feel free to contact me with any questions you might have about this fabulous opportunity - I would so LOVE to have you join my wonderful "Friends Forever Stampers" team so you can join in on all the fun we're gonna have at Convention again next Summer! 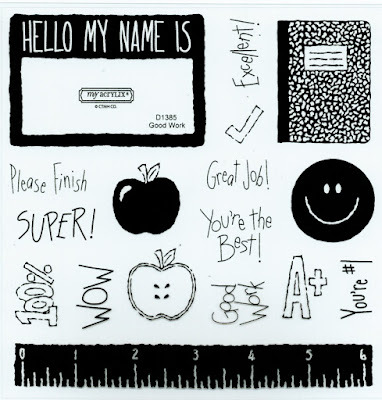 "Good Work" stamp set Giveaway!! 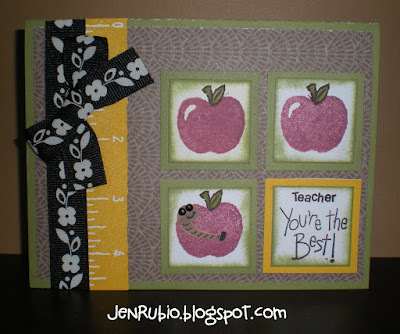 My dear friend Nancy is offering a great "GIVEAWAY" on her blog The Apple Basket Teacher to celebrate reaching 200 blog followers! 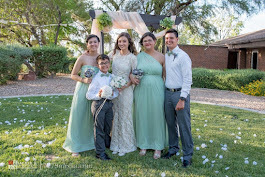 Nancy is a busy wife, mother of three, a fantastic third grade teacher, a creative scrap-booker, stamper, and paper-crafter, and an avid blogger too! 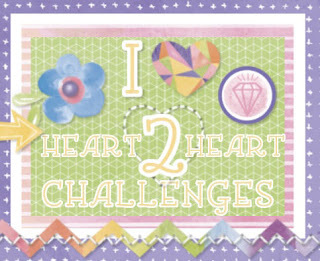 The prize she's giving away is a $20 gift card to Dollar Tree as well as this super fun stamp set with a 2x2 acrylic block from me!! This is the "Good Work D1385" stamp set that will be retiring at the end of this month. 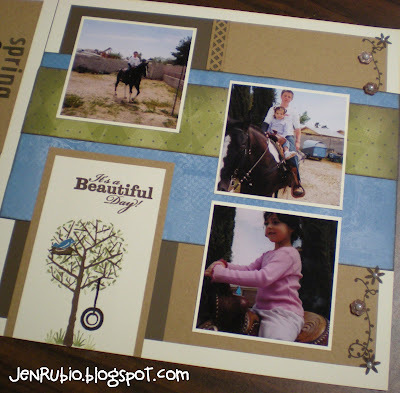 This stamp set is still available to order from my website www.StampwithJen.myctmh.com, but only until July 31st!! If you'd like a chance to win it for free simply go to Nancy's Blog now and become a follower. You can get extra chances to win by leaving comments, so be sure to scroll down and read her posts fully and follow her directions for the most chances to win!! Her contest ends soon (Tuesday 7/26 at 8pm pacific time zone) so you'll want to act quickly to enter now!! Wishing you all lots of good luck! 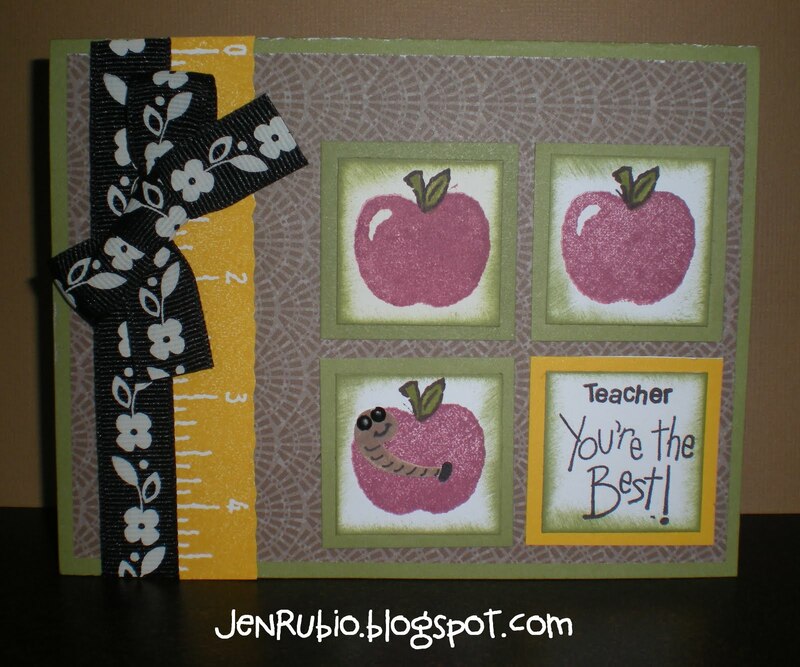 Come see me Saturday 7/23 (and create this FREE card)! I'm just sending out a quick reminder to come join us tomorrow (Saturday 7/23) starting at 4pm for my NEW Idea Book Reveal Party (and Open House)!! Consultants on my team (the Friends Forever Stampers!) are invited to come for a "consultant only" meeting starting at 2pm. Please call or text me on my cell at (760) 220-0683 if you need directions to my house. 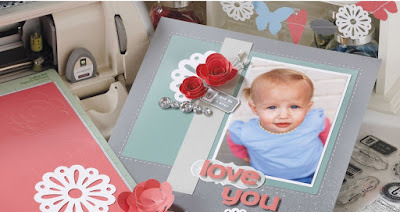 I will show you how to create this easy-to-make card using all-NEW stamps (Love Life D1482 and the August 2011 Stamp of the Month - Wicked S1108), NEW papers (Roxie X7140B), and NEW embellishments (Just Blooms paper shapes butterflies Z1463 and Bling assortment buttons Z1466). 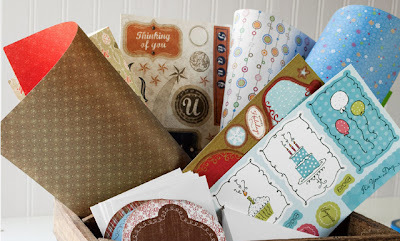 I will also be giving away the NEW Autumn/Winter Idea Book and Catalog to all of my guests and will have a variety of current products (as well as a selection of my used stamps) available at low, low, clearance sale prices!! I hope you can join us for the creativity, food, friends, and fun!! Please join us this Saturday 7/9 for our Saturday Night Scrappers Crop from 4pm-10pm. 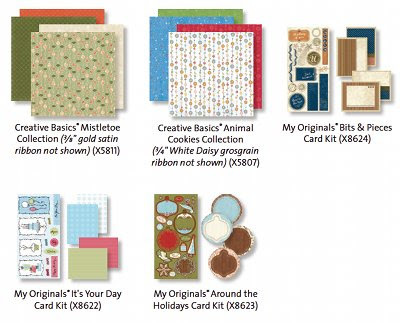 In addition to this FREE play-time in my stamp room (bring any projects you'd like to work on), I'm also offering an "optional" $7 scrapbooking class. 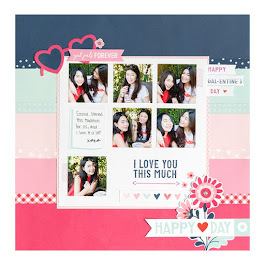 The layout we will create together is inspired by the layout shown below in this YouTube video (using the "Trees and Things" stamp set with the Lucky papers)! 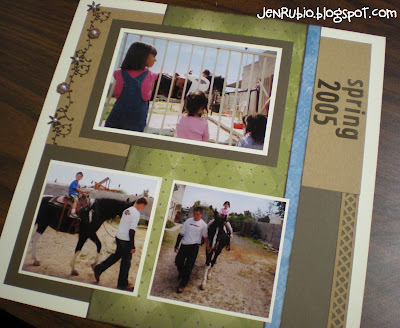 Our class layout design is inspired by Magic - Showtime (page 106) and it can be used with 5 photos cropped to 4"x4" and one 4"x6" OR one 5"x7" photo. Please bring your adhesive as well as any photos you have to complete these pages (or you can always add your photos later if you need to). Space is limited, so please RSVP ASAP if you plan to join us (and especially if you want me to save you a class layout kit)! I hope you enjoy the video below too!! 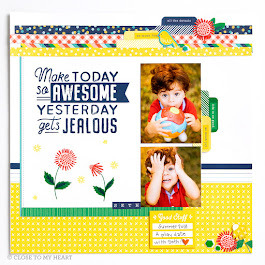 My Acrylix® Trees & Things is the perfect stamp set for showing off lots of neat techniques, including rock 'n' roll, second generation, masking, and more! 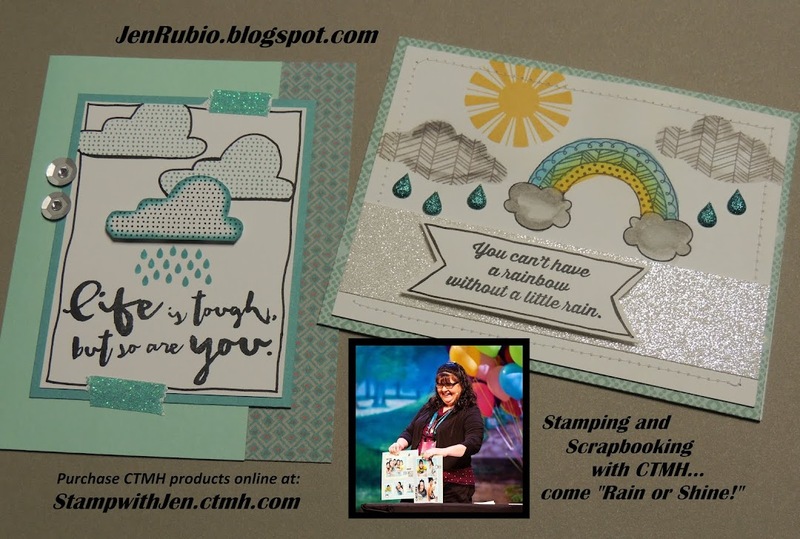 In this short video, we take these stamping methods to the next level of creativity on cards, a scrapbook page, and even a journal. Easy and fun for all of our stamping-crazy customers or those just learning! 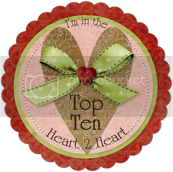 * ALL Level 1 My Reflections kits!! Now is a great time to purchase any of the items you don't want to miss out on! Your purchase can also help you earn the July Stamp of the Month - American Celebration D1458 for free or at a discount, as well as help you take advantage of getting a bonus item for just $1!